U.S. Army Lt. Col. Heather McAteer, commander of the 44th Expeditionary Signal Battalion, and Command Sgt. Maj. Sean Mitcham, 44th Expeditionary Signal Battalion senior enlisted leader, case the unit’s colors at a ceremony April 2, 2019, in Grafenwoehr, Germany. The battalion is relocating to Baumholder as part of overseas force structure changes resulting from the 2017 National Defense Authorization Act, showing continual U.S. commitment to NATO and its collective defense. Photo by William B. King. 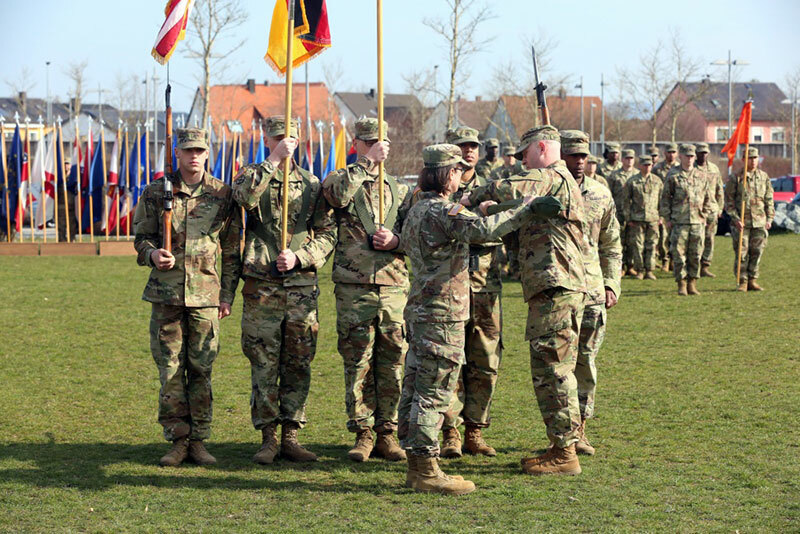 GRAFENWOEHR, Germany – The 44th Expeditionary Signal Battalion cased its colors and bid farewell to Tower Barracks at a ceremony April 2, 2019, in Grafenwoehr. The battalion is relocating to Baumholder as part of overseas force structure changes resulting from the 2017 National Defense Authorization Act, showing continual U.S. commitment to NATO and its collective defense. The casing of the colors signifies the restationing of the battalion headquarters, though it will still take some more time to fully move the remainder of the unit’s Soldiers, families and equipment to Baumholder. McAteer thanked the many individuals and organizations at U.S. Army Garrison Bavaria and U.S. Army Garrison Rheinland-Pfalz that helped to make the unit’s transition go smoothly. She also thanked her Soldiers and leaders for their professionalism, and families for their love and support throughout the transition. “It’s great to be part of this tradition where our Soldiers not only play a role in the history of the regiment, but start a new chapter,” McAteer said. The 44th Expeditionary Signal Bn. traces its roots to 1944, and since being permanently stationed in Germany in 1981 the unit has had headquarters in Mannheim, Ettlingen, Mannheim again, Schweinfurt, Grafenwoehr, and now Baumholder. “We will continue our legacy of excellence under 2d (Theater Signal) Brigade, and earn our 44th motto everyday – we are ‘Outstanding!’” McAteer said. The unit will uncase its colors Thursday at its new home in Baumholder.